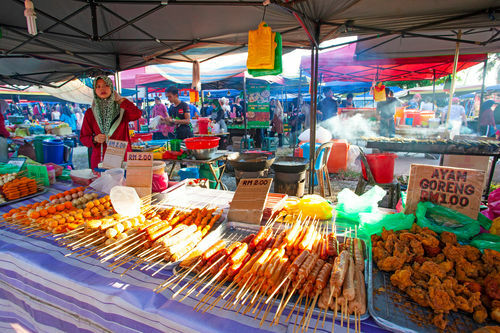 On every day of the week, a night market (also known as Pasar Malam in Malay) sets up in different places of Langkawi. There is a different and designated location for the market each day. It is like a country bazaar or a street market. Many vendors and villagers set up makeshift stalls at these markets and sell all kinds of local items including food & snacks, fresh produce, fruits & juices, clothes, souvenirs & trinkets, watches, sunglasses, wallets & hand bags, paintings, DVDs and many other small items. These local markets are great for trying out various types of local food at relatively cheap prices. The atmosphere is also quite friendly. The night market is a great meeting place for the locals and expatriates, and if you are a tourist, it's a great opportunity to meet and be with locals and enjoy local food. Although there is nothing much to shop here, it is mostly popular for a wide range of Malay dishes that are prepared and served piping hot at a very reasonable price. Some of the dishes that are our favorites here include the grilled seafood, chicken or beef satay, murtabak, green mango salad, lemon grass chicken on sticks, fresh fruit juices and so on. Some dishes can be really spicy. This is the favorite pace for the local working class, who come here after the tiring day's work and have hot dinner at a cheap price. Two persons can easily have sumptuous meals for a total of RM15. There are also local meals that are kept already prepared in plastic bags (grab and go meals). They too are quite cheap. For example pulut ayam or nasi ayam would cost RM4. Most of the other food items will be between RM 2 - 4. You will get almost all the great dishes that I have mentioned in Langkawi Local Food & Outlets and that too at cheap prices. But you should be a bit careful with the hygiene factor. Sometimes cooked food kept in the open idling for a while is not good and can cause stomach problems. Always try to take fresh food being prepared right in front of you. I have never had tummy problems in Langkawi. All that you need to ensure is that you are taking hot food prepared fresh. There would be hardly any place to sit. Most of the stalls do not have seating provisions. So either you can stand and eat, or take away the packed food which many locals do. In Kuah town, if you walk up to the end of the Night Market, there is a food court where you can carry your food, sit and eat. These local night markets are also great if you are looking to buy some cheap items like wallets, t-shirts or bags, or just like to enjoy the local market ambience in a village like setting. Note that the watches, sunglasses and all the displayed known brands are likely to be all fakes. 1) Sunday Night Market at Padang Matsirat - Takes place on every Sunday night at the large car park area near the Field of Burnt Rice. 5) Thursday night Market at Temoyong Night Market in Pantai Cenang. It takes place on every Thursday night at the Tamoyong village in Pantai Cenang. 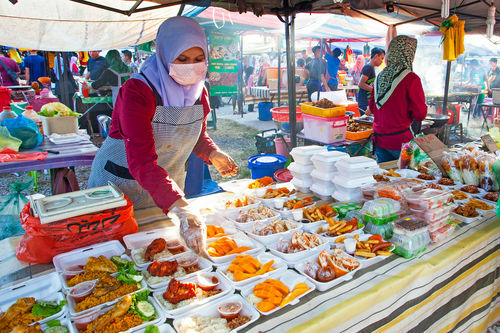 However the largest and the most active night markets out of the seven above are the ones at Kuah and Padang Matsirat. The night market runs from 7pm until 10pm, after which the vendors dismantle their stalls and take their stuff back home by vehicles. If it's raining on the day, many vendors won't turn up to set up their stalls. Once you reach the area, you can ask any local for Pasar Malam, and he/she will show you the direction. If you are visiting on a taxi, ask the driver.